You are here: Home › Further Reading › JFK Assassination FAQs › What Do People Think About the JFK Assassination? In opinion polls since the late 1960s, the general public has consistently rejected the lone-nut hypothesis. Public opinion about the JFK assassination does not agree with that of the news media. The lone–nut hypothesis, strongly promoted by the media, is rejected by the general population not because people get their information on the subject from conspiracy–oriented books, but because they adopt the same critical attitude to the assassination as they do to other, similar topics. The main polling organisations take surveys of popular opinion about the assassination from time to time. In most cases, the survey questions have been restricted to a simple choice: lone nut versus conspiracy. 1963: Do you think that the man who shot President Kennedy acted on his own, or was some group or element also responsible? 1966, 1976: Do you think that one man was responsible for the assassination of President Kennedy, or do you think that others were involved? 1983, 1992: Do you think that one man, Lee Harvey Oswald, was responsible for the assassination of President Kennedy, or do you think that others were involved in a conspiracy? 1993, 2001: Do you think that one man was responsible for the assassination of President Kennedy, or do you think that others were involved in a conspiracy? 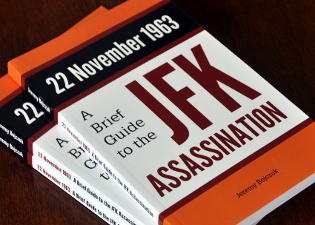 Hundreds of books have been published on the JFK assassination. Most of them are given little publicity, and presumably do not sell in large quantities. Those with the largest publicity budgets tend to be uncritical or sensationalist, and pose little threat to the lone–nut hypothesis. Gerald Posner’s Case Closed , for example, received coverage in newspapers and magazines, and on television and radio, that was quite out of proportion to the credibility of its analysis. The conspiratorial book most heavily promoted in the media was probably David Lifton’s Best Evidence , which proposed that President Kennedy’s body was surgically altered to conceal evidence of shots from the front. To the majority of the general public, unfamiliar with the details of the JFK assassination, such a proposition must seem too far–fetched to be taken seriously. Best Evidence was a safe book to promote. As Roger Feinman pointed out, Lifton “is the perfect public spokesman for the assassination research community, only if we look at things from the perspective of both the government and the established news media”. Although Lifton performed some useful research, his theory is far from conclusive and is not a central part of the argument against the lone–nut hypothesis. The books that make the most convincing case for conspiracy, such as Gerald McKnight’s Breach of Trust and Sylvia Meagher’s Accessories After the Fact , have received hardly any publicity in the mainstream media, and are surely unknown to almost everyone who takes part in opinion polls on the subject. The general public gets its information about the JFK assassination largely from the established media, which, in the US at least, overwhelmingly depicts the assassination as the act of a lone nut named Lee Harvey Oswald. On the rare occasions when the possibility of a conspiracy is acknowledged, Oswald is assumed to have been an active participant in the plot. From the point of view of most media commentators, such conclusions are perfectly rational. Two official inquiries concluded that Oswald was a gunman. According to the first, he acted alone; according to the second, he almost certainly acted alone, but may perhaps have had associates. The inquiries were official, so their conclusions must by definition have been justified. Therefore Oswald was a gunman who almost certainly acted alone but may perhaps have had associates. In the first few days after the assassination, a majority took seriously the idea of a conspiracy, as information inconsistent with the lone–nut explanation was widely broadcast: evidence of shots from more than one direction, Oswald’s apparent contacts with representatives of the Soviet and Cuban regimes, and Jack Ruby’s connections to organised crime. Towards the end of 1964, the balance swung towards the lone–nut explanation as the media heavily promoted the Warren Report ’s conclusions. The public had adopted a more critical attitude by 1967, following the publication of the first wave of properly researched critiques of the Warren Report , such as Sylvia Meagher’s Accessories After the Fact: the Warren Commission, the Authorities, and the Report . In the mid–1970s, public belief in conspiracy intensified following two events: the broadcast on national television of a copy of the Zapruder film, which contained prima facie evidence of a shot from the front; and the Schweiker–Hart Report’s revelations of assassination attempts by US intelligence agencies on official enemies such as Fidel Castro. The proportion of those questioned who believed that the JFK assassination was the result of a conspiracy rose to about three out of four in late 1991, when Oliver Stone’s film, JFK , got into the news. The proportion seems to have remained at or above 75 per cent in the two decades and more since JFK was released. Whatever their views on the JFK assassination, only a small minority of those questioned can have had anything more than a superficial knowledge of the subject. Few will have heard of Lee Harvey Oswald’s impersonation in Mexico City, which does not form part of the standard media narrative despite being a central event in the assassination. Even among specialists, hardly anyone is familiar with the neutron activation analysis of Oswald’s paraffin casts, which suggests very strongly that he had not fired a rifle at all on the day of the assassination. It is not only the general public that lacks specialist knowledge. Pundits in the media, who for institutional reasons overwhelmingly endorse the lone–nut hypothesis, give every impression of being just as poorly informed as the general public. and that the Warren Commission did not perform an honest investigation into the assassination. Even though the majority of the information that reaches the general population is supportive of the lone–nut hypothesis, enough contradictory information gets through to allow the official interpretation to be rationally questioned. Are JFK Assassination Beliefs Rational? The surveys quoted above were of US residents only, and may or may not be consistent with opinion elsewhere. There is one type of belief in which north America differs notably from most industrialised countries: the US and Canada contain a disproportionately super–sized number of believers in fundamentalist religion. The figure usually given for belief in one or another form of creationism has consistently been not far from 50%, according to Gallup: 44 per cent in 1982, and 46 per cent in 2012. For the results of a detailed survey from 1988 of religious belief in the US, see George Gallup, Jr, and Jim Castelli, The People’s Religion: American Faith in the 90s , Macmillan, 1989. Perhaps the ‘dumb Yank’ stereotype applies also to the JFK assassination, and the large pool of ignorant and credulous folk who cannot find Africa on a map, or who believe in young–earth creationism, includes those who believe that a conspiracy assassinated President Kennedy. Churches and religious radio stations are easily accessible to the reactionary and poorly educated sectors of the population which form the main audience for fundamentalist religion. There is no such network for those who question the official doctrine on the JFK assassination, a group which surely relies extensively on the mass media for its information on the subject. and they seize on the few items of critical information that the mainstream media does provide. Over a substantial period of time, belief in a Kennedy assassination conspiracy has been related to a political world view which sees the government as failing to provide its citizens with the help they feel they need to cope with the problems of modern life. This failure is not seen as being due to the inability of the president — the symbol of our government — to do a great deal to solve them. Rather he, and the government, could solve them, but choose not to, preferring to put the needs of the upper classes above those of working and middle class Americans. Many opinion polls, mostly unreported outside the specialist literature, show a large majority in favour of such subversive notions as a more equitable distribution of wealth and power. According to one survey of the literature, 82 per cent of the US population believes that the “government is run for the benefit of the few and the special interests, not the people” (Everett Carll Ladd, ‘The 1994 Congressional Elections: The Postindustrial Realignment Continues,’ Political Science Quarterly , Spring 1995, p.13). The best–known case is probably the opinion poll taken by the Boston Globe in 1987, on the 200th anniversary of the US constitution, in which respondents were given a list of sayings and were asked to identify those that were so obviously reasonable that they had to be part of the constitution. 45 per cent of the respondents approved of the notion ‘from each according to his ability, to each according to his needs’ (see Laurence H. Tribe, ‘To Praise the Constitution or to Bury It?’, Boston Globe Magazine Special Supplement , 13 September 1987, pp.8f; the respondents were not told that the quotation was from Karl Marx). The public has consistently adopted a critical attitude to the Vietnam War, in notable contradiction to the media, which has published even less dissent on this topic than on the JFK assassination. Even though opposition to the war has decreased along with its relevance to everyday lives, the population has always rejected the media’s strongest criticism, the tame notion that the Vietnam War was a worthy cause that was improperly carried out: “respondents were asked how they felt about the statement that the Vietnam War ‘was more than a mistake; it was fundmentally wrong and immoral.’ In 1986, 66% of the public concurred, compared with 72% in 1978 and 1982. A total of 27% disagreed ‘somewhat’ or ‘strongly’ with the statement, compared with 21% in 1982 and 19% in 1978” (John E. Reilly, ed., American Public Opinion and US Foreign Policy 1987 , Chicago Council on Foreign Relations, 1987, p.33). The widespread belief that the JFK assassination was the result of a conspiracy is just one aspect of a widespread recognition that national institutions do not represent the interests of the general population. Did Lee Harvey Oswald Carry Curtain Rods to Work?